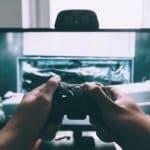 Are you getting the Application Has Been Blocked From Accessing Graphics Hardware error message when playing games? Here is how to get rid of this irritating error and play your favorite games normally. Last week, I received some emails from users who asked about this error and want me to help them get rid of it. As they said, this error popped up when they want to play some games, such as Minecraft, World Warcraft 3, or Fifa. It appears that the game wants to access graphics hardware, but Windows has blocked it for an unknown reason. 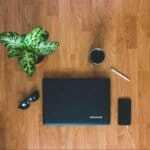 In this post, I would like to share with you a few useful methods that I used to help my readers to resolve this annoying error. If you are getting the same error, follow up my solutions to get rid of it. In most cases, this error occurs because something has gone wrong with the driver of your Intel graphics card. Therefore, if you want to resolve this problem, reinstalling the driver of your in-chip graphics card is the best choice. Firstly, you need to visit the Intel’s Download Center to download the latest version of Intel Graphics Driver for your Windows 10 computer. Then, there are two choices you can select from: download installable file (.exe), or download compressed file (.zip). If you choose and download the installable file (.exe), press Windows + X, then select “Device Manager” from the context menu (or press M to open instead). Next, expand “Display adapters” and right-click on your in-chip graphics card. In my case, it’s “Intel® HD Graphics 4600“. 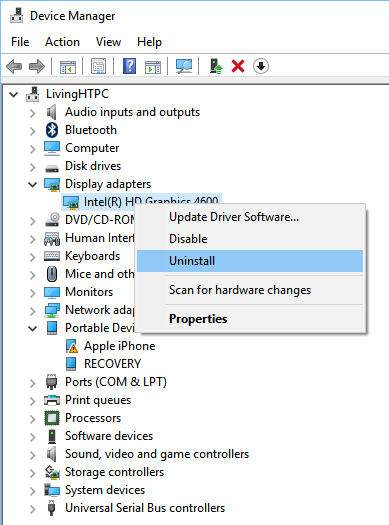 In the next step, choose the “Uninstall” option and tick the “Delete the driver software for this device” checkbox to remove the driver out of your Windows PC. Next, click on the installable file you have downloaded before and start to set up a new driver for your built-in-chip Intel graphics card. If required, reboot your computer after the installation process is complete! If you select and download the compressed file (.zip), extract it to a particular folder. In the next step, press Windows + X and then hit the M key to open Device Manager. 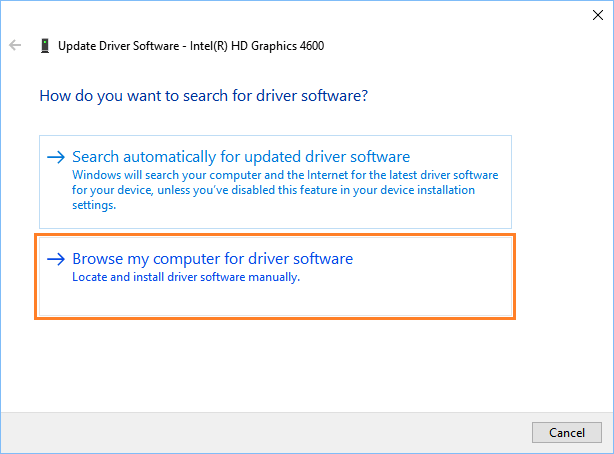 Expand the “Display adapters” option and right-click on your Intel graphics card and then select the “Update Driver Software…” option. In the next step, select the folder you have extracted that contains the driver files for the Intel graphics card. Then click on the “Next” button to install the driver. Once the driver has been installed successfully, you can restart your Windows PC. If the method above doesn’t work, you can try using Windows Registry Editor to adjust the value of TdrDela entry, which represents for Timeout Detection and Recovery. 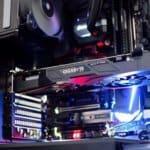 Increasing this value will increase the processing time of your graphics card, which helps to get rid of the Application Has Been Blocked From Accessing Graphics Hardware error in Windows 10. To adjust this value, press Windows + R, type: regedit and then press Enter to open Windows Registry Editor. Next, create a new DWORD (32-bit) entry named TdrDelay. Then double-click on it and set the value to be 8. Click on the “OK” button to save the change. After that, close Registry Editor and restart your computer. In several cases, corrupted or missing system files that are related to your graphics card can lead to this error. To resolve this, you can use the System File Checker and DISM tools to scan for corrupted/missing files and replace them if available. To get started, press the Windows + X combination and then choose the “Command Prompt (Admin)” option. In the Command Prompt window, type: sfc /scannow and hit the Enter key to execute the command. It will take a while to search for corrupted/missing files and replace them. So just wait for the process to complete and be patient! After the System File Checker tool has done its job, perform the following command to run the DISM tool. 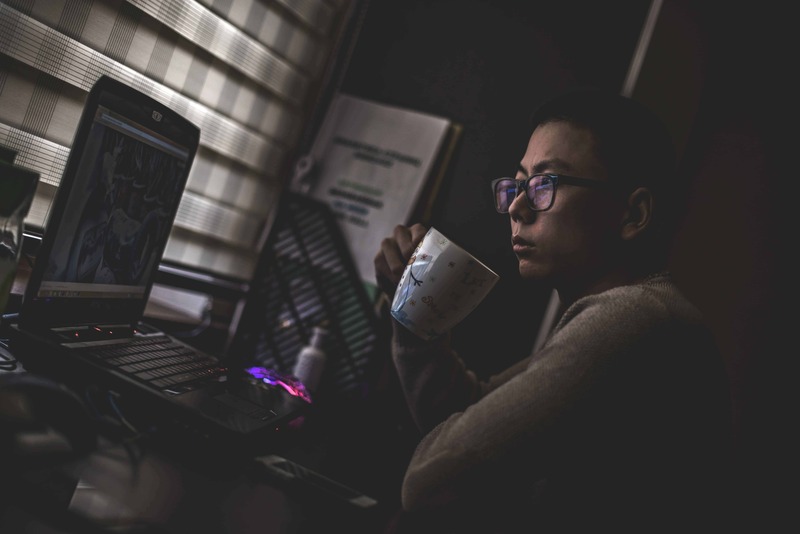 Once it’s done, reboot your Windows computer and check again whether the error is fixed or not. In case you have tried all methods above and the error persists, I would recommend using Windows System Restore to roll back your Windows OS to a previous point when it’s still in the good state. Otherwise, you can try to reset your Windows 10 computer, but keep the personal files. However, if you choose to reset your computer, all installed apps will be removed and you’ll have to download and install them again. I hope this guide will help you to learn more about the Application Has Been Blocked From Accessing Graphics Hardware error on your Windows 10 computer, as well as how to diagnose and get rid of it. If you have any questions about this error, drop a comment below!